The Trump administration’s Nuclear Posture Review (NPR), just released, lays out a policy that will make the use of nuclear weapons more likely and undercut US security. It includes a wide range of changes to US nuclear weapons policy and calls for deploying additional types of nuclear weapons. Some of these changes can take place relatively quickly—within the time remaining in President Trump’s term—and others will take years to realize. In the latter case, however, political repercussions could occur well before completion of the effort. This post looks at some of the near-term changes and consequences. In a future post, I’ll talk about some of the longer-term implications of the NPR. The document asserts the new US policy “is not intended to enable, nor does it enable, ‘nuclear war-fighting.’”(p. XII) For a regional conflict, “nuclear war-fighting” refers to using nuclear weapons in an ongoing way once a conventional conflict has expanded to include nuclear weapons. And if training to use nuclear and conventional forces in an integrated way isn’t preparing for nuclear war-fighting, what is? Russia and China will certainly view it that way, and the exercises themselves will be provocative. The new policy deliberately blurs the line between nuclear and conventional forces and eliminates a clear nuclear fire break. Doing so is not in US security interests. Low-yield, accurate nuclear weapons are often described as “suited for war-fighting,” and would be an important component of the integrated nuclear and conventional force that the administration is planning for. As discussed below, the administration plans to deploy a new lower yield weapon on submarines. But the United States already has two types of low-yield weapons that it could use as part of an integrated force. These bombs allow the user to choose the yield of the weapon; depending on the variant, the yield ranges from 0.3 to 170 kilotons. The lowest yield of 0.3 kilotons is 50 times smaller than the yield of the bombs that destroyed Hiroshima and Nagasaki—which certainly qualifies as a warfighting weapon. The United States also deploys 200 nuclear air-launched cruise missiles in the United States for delivery by long range bombers. These have variable yields ranging from 5 to 150 kilotons. With these weapons the US military can begin planning, training and exercising with an integrated force of conventional and nuclear weapons—including low-yield weapons—within a year or two. The new policy described in the NPR broadens the scenarios under which the United States would use nuclear weapons first, thus lowering the threshold for first use. The document explicitly lists a wide array of non-nuclear attacks that could constitute grounds for a US nuclear response. Russia must … understand that nuclear first-use, however limited, will fail to achieve its objectives, fundamentally alter the nature of a conflict, and trigger incalculable and intolerable costs for Moscow. The NPR states that the United States will replace some of the warheads on its submarine-launched Trident ballistic missiles with “low-yield” versions. These warheads would have a yield of roughly five kilotons; for comparison, the W76 and W88 warheads currently deployed on submarines have yields of 100 and 455 kilotons, respectively. Such a low-yield warhead can be produced by modifying an existing two-stage W76 or W88 warhead so that just the first stage explodes, which can be done relatively quickly. These weapons can—and likely will—be deployed during this presidential term. 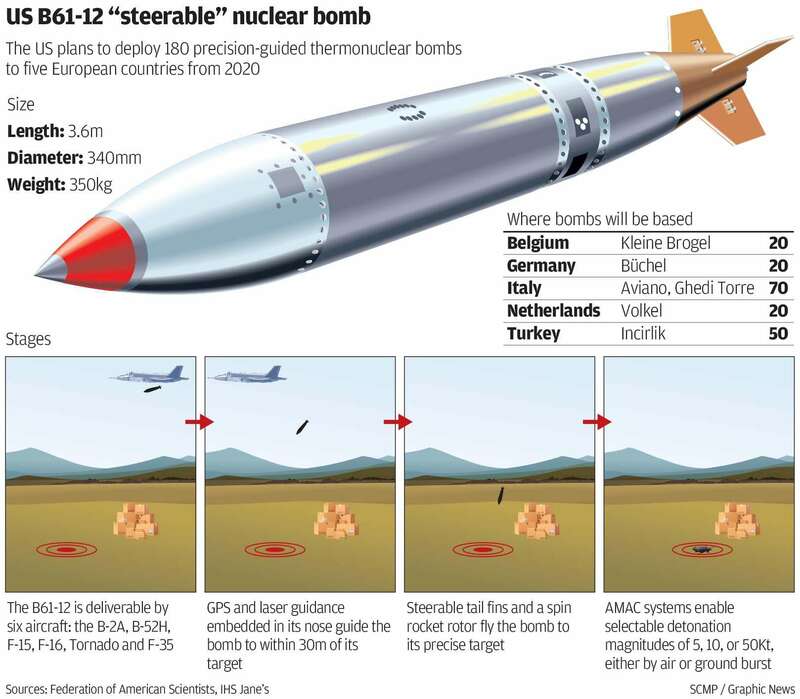 As noted above, the United States already deploys low-yield bombs and air-launched cruise missiles with yield options that range from 0.3 to 150 kilotons. These arguments are spurious. The United States can deliver its bombs and air-launched cruise missiles using long-range bombers based in the United States—these require no host nation support. It is a truism that adding new types of weapons increases diversity, but it is irrelevant. It is also true that a ballistic missile will be able to penetrate defenses (especially since none exist), but this does not give it an advantage over the existing systems. The B-2 stealth bomber is designed to evade sophisticated air defenses, and the air-launched cruise missile can penetrate air defenses. Regardless of what the military thinks US nuclear weapons are deterring other countries from doing, to argue that the current arsenal is inadequate but will become adequate if we throw in a few low-yield Trident warheads is just silly. While claiming that the United States “continues to abide by its obligations” under the NPT, the NPR ignores the US obligation to take effective measures toward nuclear disarmament. Since the end of the Cold War, the United States has made progress—albeit slow progress—in reducing the number, types, and role of US nuclear weapons. The new policy reverses that progress. The non-nuclear weapon states are already fed up with the slow progress of the United States and Russia, and in response last year they negotiated a treaty banning nuclear weapons. The Trump NPR is a giant slap in their face. Walks back from negative security guarantees. Negative security guarantees—in which the nuclear weapon states assure countries without nuclear weapons that they will not be subject to a nuclear attack—are vital to the NPT. Such guarantees reduce the incentive for countries to acquire their own nuclear weapons to counter threats from the nuclear weapon states. They were also key to the 1995 decision by the non-nuclear weapon states to extend the treaty indefinitely. The United States will not use or threaten to use nuclear weapons against non-nuclear weapons states that are party to the NPT and in compliance with their nuclear nonproliferation obligations. For 50 years now, the NPT non-nuclear weapon states have made it clear that they place high importance on achieving a treaty prohibiting nuclear explosive testing. The 1968 preamble to the NPT discusses the imperative of negotiating such a treaty, and when the non-nuclear weapons states agreed to indefinitely extend the NPT in 1995, it was predicated on their understanding that the Comprehensive Test Ban Treaty (CTBT) was near completion. The CTBT was opened for signature in 1996. The United States has signed, but not ratified the treaty. Over 20 years later, the treaty has still not entered into force, in part because the United States has not ratified it.